Finally, spring is in the air! Gone are the horrible long winter nights, and out come the shorts. With reports of temperatures in the ‘high teens’ this weekend, where will your PA28 take you? Well… how about Cranfield? This month, Cranfield seem to have caught onto not only the spring sunshine, but also the cheap landing fees which are normally only found in the basking sunshine of mainland Europe. Cranfield is now offering all GA pilots, landing with a MTOW weight of under 3,000kg, landing fees of only £3.95 INC VAT! What to do when you get there? Well, everyone loves the famous £100 aviation sandwich, but perhaps you would prefer a Tea or Filter Coffee, with a bacon sandwich, for only £3? So, for less than £7 you can land and get food & drink. With the possibility of doing some VOR tracking on the way, a practice ILS inbound and a nice long runway – Cranfield is where it’s at in March! Welcome to our new weekly airfield feature: Feature Friday. Each week we will be featuring a new airfield for you to explore for the weekend. This week we take a look at Turweston. Turweston is a well known jaunt for all those flying with Freedom. Many will be familiar with the route from their training days. 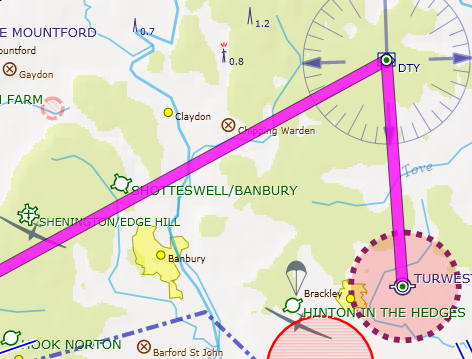 The standard route which we fly from Kemble to Turweston is: Kemble -> Chedworth -> Moreton-in-Marsh -> DTY VOR -> Turweston. Chedworth is disused airfield to the north of Kemble. The leg is just under 1oNM long, so quite short. Be careful to avoid turning directly onto the dead side after departure. The best way to depart Kemble is by climbing in the circuit into the overhead. Once overhead, set course for Chedworth. Another short leg, about 14nm, but a nice one. 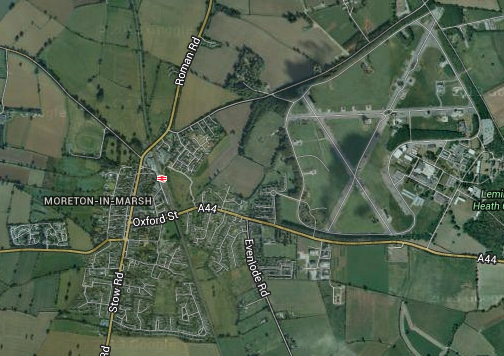 Moreton is an easy one to spot – a large disused airfield with a town to the south-west. A great opportunity to practice some VOR tracking. Don’t be temped to go direct to Turweston – going via DTY will ensure you miss Hinton In The Hedges parachute center. As much as you would like to save a few quid, the skydivers probably wouldn’t feel feel the same way. Track inbound to DTY on approximately the 245 radial (065 with the TO flag). The leg is approximately 24NM. Don’t forget to identify both the VOR and DME! From DTY, track outbound on the 177 radial to 8.4D and wahey – Turweston. From the north, join overhead and descend on the dead side to the south. Circuits are at 1,300ft. 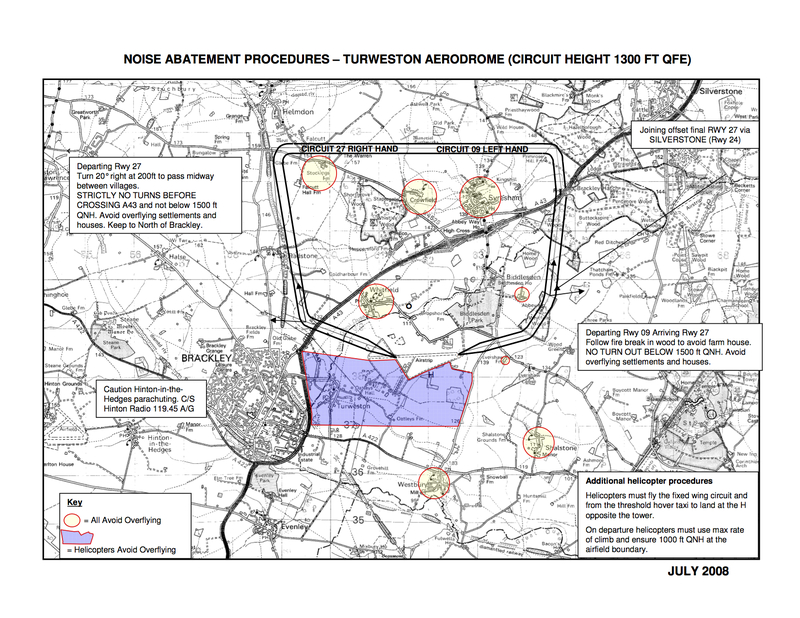 Once established crosswind, there is quite a significant noise abatement procedure (see the plate below). 1. Egg, Bacon and Sausage Bap with free bag of crisps for less than £4! 2. Free landing fee if you uplift 40 liters of fuel. Ask Sarah/Dave before filling up though….